Tom Petty remembers the Heartbreakers' bassist, who died February 23rd of a suspected heroin overdose at forty-seven. The first time I saw Howie, he was in Del Shannon's band. He looked like a young pirate -- this cowboy-pirate from Milwaukee. He played the bass, and that was really great, but then he sang and just knocked me out. From that moment I was forever a fan, because Howie could sing that nice, clear, high harmony. When I asked Howie to join the Heartbreakers in 1982, Del was pissed off with me. Bless Del's soul, he said, "Wow, you can't take Howie." I said, "Del, I love you, but I'm taking Howie." Howie always fit in with the Heartbreakers. Around the time we were playing with Bob Dylan, Howie really started to blossom. He felt more a part of us by then. Yet he told me not too long ago, "You know, I've never been hired. Nobody ever said, 'You're in the band.'" He was such a kind, gentle soul -- such a sweetheart. I don't think I ever heard him raise his voice in twenty years. When we were inducted into the Hall of Fame last year, he said, "I've been the new guy for twenty years." I was lucky to have him around. On "Mary Jane's Last Dance," that really high falsetto vocal track, that's Howie. On most of our tracks from the Eighties on, he did amazing things. I was with the band today, and there's a deep sadness, because Howie was never not a Heartbreaker. He just got to where he couldn't do it anymore. Any stringed instrument Howie picked up, he could play great. And he had such an understanding of harmony. He knew every Byrds songs -- he even knew the ones you weren't supposed to know. And he was a great producer -- The Missing Years, for John Prine, was incredible. He had so much going on, which makes it all the more a shame. It's so off, but inside there was some turbulence going on. 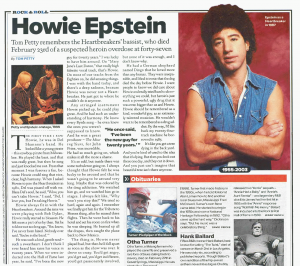 I always thought that Howie felt he was lucky to be around and tat he wasn't going to be around very long. Maybe that was colored by the drug addiction. He watched him go, and we watched him go in stages. I always felt like, "Why won't you stop this?" We tried so hard, again and again. I remember we finally got him for the Tribute to Heroes thing, after he missed three flights. Then he went to his hotel and set his room on fire when he was sleeping. He burned up all the drapes, then caught the plane back to New Mexico. The thing is, Howie never played bad, but then he'd fall apart as soon as the show was over. It drove us crazy. You'd get angry, you'd get sad, you'd get indifferent, you'd get passionately involved, but none of it was enough, and I don't know why. He had a German shepherd named Dingo that he loved more than any human. The were inseparable, and I find it ironic that the dog died the day before Howie. I want people to know we did care about Howie and we really tried hard to do everything we could, but heroin's just such a powerful, ugly drug that it as even bigger than us and Howie. Howie should be remembered as a kind, wonderful guy, as an extremely talented musician. He wouldn't want to be remembered as a drug addict. By the way, I'd like back my twenty-four-track machine he borrowed in 1985. It's like you got a tree dying in the back yard. And you're kind of used to the idea that it's dying. But then you look out there one day, and they cut it down. And you just can't imagine that beautiful tree isn't there anymore.